Will China use Vietnamese origin to export woodwork to US? VietNamNet Bridge - The massive arrival of Chinese enterprises to Vietnam to set up woodwork processing workshops has raised concern that China may exploit Vietnamese origin to export products to the US and avoid high taxes. Thanh Nien quoted Tran Viet Tien, director of Lavanto Home Décor, as saying that if China counterfeits Vietnamese origin to export products to the US, this will badly affect Vietnam’s exports to the US and the Vietnam brand. The US is a big export market for Vietnam. China is a big woodwork supplier to the US market. The US decision to raise tax on woodwork imports from China will lead to higher prices of woodwork products and lower purchasing demand. The high growth rate in woodwork exports from Vietnam to the US will bring adverse effects in the long term because the US may set up technical and tariff barriers to restrict imports. The US is a big export market for Vietnam and any changes will be ‘dangerous’ for Vietnam. An analyst said if China wants to counterfeit Vietnamese origin, it may set up processing workshops in northern provinces in Vietnam to take full advantage of the cheap labor force here. 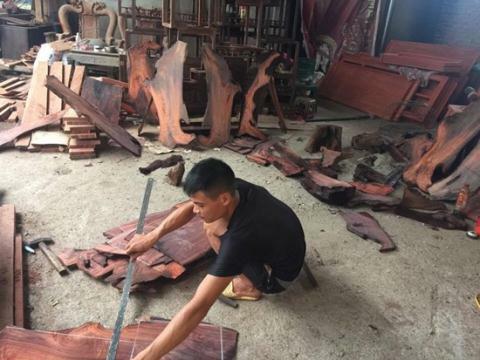 Meanwhile, Nguyen Chien Thang, chair of Scansia Pacific in Dong Nai province, thinks that it would be more difficult to counterfeit the Vietnamese origin for woodwork, because the products are cumbersome and require high transportation fees. However, he said small Chinese enterprises may come to Vietnam and open workshops under Vietnamese names. If so, the domestic woodwork industry will be affected. In principle, according to the Ministry of Industry and Trade, the US imposition of high taxes on Chinese woodwork products will bring great opportunities to Vietnam. Thang said the number of US clients showing interest in Vietnam’s woodwork products has begun to increase. It is understandable: they want to find alternative suppliers. However, Thang doesn’t think it will be easy for Vietnamese manufacturers to exploit the US market, because the number of US companies investing in Vietnam is relatively high. In order to increase exports to the US, analysts said, Vietnam need control material imports. Vietnam has to import 20-30 percent of materials it needs in 2018 and following years. In 2017, Vietnam imported $363 million worth of materials from China, an increase of 27 percent over the year before. The use of Chinese materials means that Vietnam’s products will bear high tax. Meanwhile, the other big material suppliers for Vietnam tend to tighten their wood exports. Steel manufacturers have also voiced concern about the possibility of Chinese enterprises counterfeiting Vietnamese origin to export products to the US.